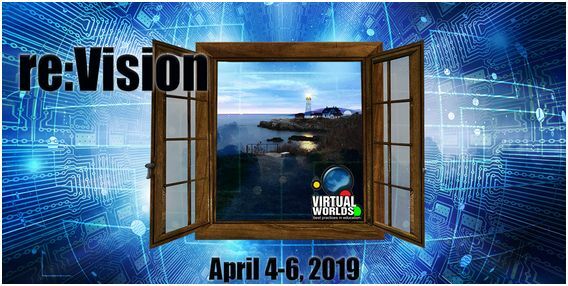 The 12th annual Virtual Worlds Best Practice in Education (VWBPE) conference was recently announced, together with a call for proposals, which combines calls for presentation proposals, proposals for exhibits, and proposals for and immersive experiences. The conference will take place between Thursday, April 4th and Saturday April 6th, 2019 inclusive. Rising from VRevolution, our Legacy of learning seeks to re:Vision the future of creation within the ecosystem of digital spaces that comprises VWBPE. Re:Vision plays a role in how multifaceted communities are contributing to and expanding best practices in virtual spaces to support play, creation, and learning. VWBPE invites you, the innovator in these endeavours, to share your re:Vision at the conference. When you submit your proposal, consider how your community contributes to the knowledge base of innovation and change through the increasingly complex landscape of digital technology. Also, for 2019, VWBPE will be partnering with vlanguages, an international collaboration effort of universities, colleges, research institutes and language educators that are working together to define and develop freely available best practices, platform and communities of support for virtual worlds, virtual reality, augmented reality, simulations and game-based language learning and training system. Following the success of 2018, VWBPE will continue the three conference presentation formats introduced in 2018: Spotlight Presentations, Hands on Technology Workshops, and Compass Points Round-table Discussions. There are seven tracks and three formats. When formulating your proposal, applicants are encouraged to consider the re:Vision theme for the conference. Full details on the seven tracks and three formats can be found on the VWBPE Applications page, together with general information on presentations and a link to the proposal submissions page. Note that the closing date for presentation proposals is Monday, January 14th, 2019. Exhibit proposals are open to those who wish to showcase their creative works in virtual worlds through artistic expression in order to promote their organisation or achievements. All exhibit proposals are reviewed by the VWBPE, and must apply to an already developed product for showcasing. Proposals should be made in one of the eight exhibit tracks: K-12 Best Practices; Higher Education/College Best Practices; Field Practices; Games and Simulations; Tools and Products; Advocacy; Support and Help Communities and Artists, Designers and Builders. Full details are available on the main VWBPE Applications page. The Exhibitor Guidelines must be reviewed prior to submitting an exhibit proposal. The Immersive Experiences category showcases locations whose main objective is interaction, immersion, and engagement for those who enter them, whether to play a game, solve an immersive problem, or engage participants in hands-on, interactive learning. All proposals for immersive experiences should be made in one of the seven presentation tracks: Analytic Thinking and Complex Problem Solving; Creativity and Innovation in Design, Practice, and Learning; Essential Accessibility in Digital and Virtual Spaces; Collaboration and Distance Connections; Multimedia Communication and Multifaceted Interactions; Ethics, Responsibility, and Tolerance and VWBPE Redux. Note that the closing date for Exhibits and Immersive Experience proposals is Monday, 11th February 2019.